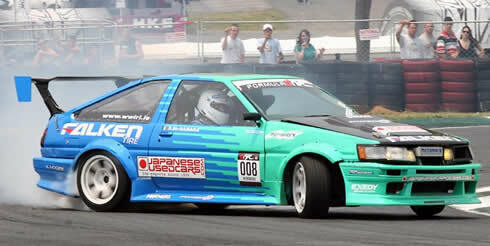 Darren McNamara took the Formula D 2007 Rookie of the year title with 1 round left to run. Top driver Darren McNamara has signed with Japaneseusedcars.com for the 2007 season and will compete in the Formula D series in the USA with the Falken Tyres works team and will also attend some D1 events. Along with this he will have a very busy European program lined up this year with planned exhibitions in the UK, Turkey, Portugal and many more including a couple of guest appearances at the infamous Prodrift Ireland Series. After the D1 World All Stars event in Irwindale last year Darren left his Blue AE86 Corolla in the U.S. so was without a suitable car to use in Europe, Japaneseusedcars.com came to the party and have supplied Darren a car to use for the European events meaning Darren will be running two cars this year. Both of Darren's cars will be carrying Japaneseusedcars.com livery for the 2007 season. Darren says "I am delighted to have agreed a partnership with Japaneseusedcars.com and am really looking forward to going back to my roots with the 4AGE powered Corolla. I cant wait to put the finishing touch's on her" He also went on to say "The car will b re-built upon arrival with ITB's, ECU, cams, under shims, NOS, suspension, a 1 off body kit, fibre glass everything, Trueno front, Work rims, Ueo suspension arms, Exedy clutch and lots more"
Darran McNamara took second place in the new car at only it's second outing in Prodrift Ireland. 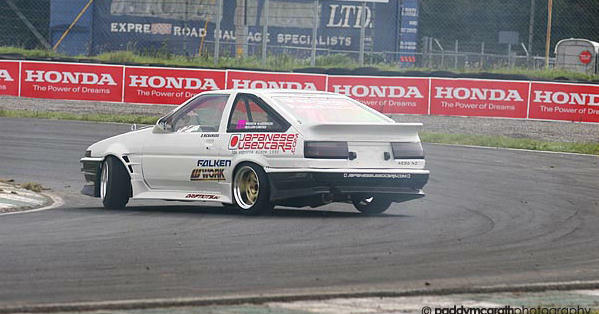 A spoke person for Japaneseusedcars.com said "Being involved with the sponsorship of the D1 UK 2006 Champion Phil Morrison and some other drivers at the D1 All Stars event in 2006 it is a natural development for us to sponsor such an exciting and fast rising star in the sport of Drifting. Darren impressed us and many others in the U.S. last December so we are pleased to be associated with such a high profile driver as Darren"
This latest signing by leading used car exporter Japaneseusedcars.com gives them two of the top drivers in the UK under their sponsorship and continues on with their commitment to helping the fast growing sport of Drifting grow around the world.